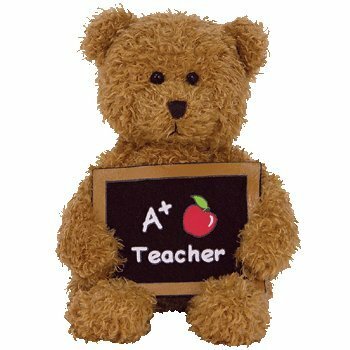 Cool Teacher is made from a scruffy brown material with black button eyes and an embroidered brown nose. He carries a blackboard in his paws with a brown frame and the words “A+ Teacher” in white writing and a red apple drawing. You’ve taught me that it’s fun to learn! Cool Teacher was introduced on 1st April 2006. His birthday is on 3rd May 2006. Ty released Cool Teacher for children to give as a gift to their school teacher. He retired on 27th December 2007.